A Queens, NY native, Mike became a Buffalo Bills fan (along with his Mom) in 1984 when the then New York Jets announced they were leaving NYC to play in New Jersey. 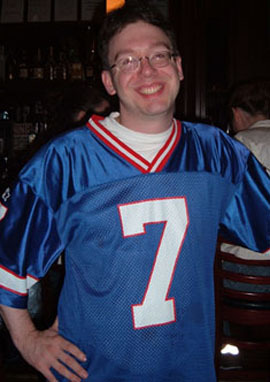 His first game as a Bills fan took place that season, watching Joe Ferguson beat the Jets he proudly wore a #12 jersey for the first time. He was rewarded by Jets fans by getting hit in the head with a stale pretzel. Mike has been coming to McFadden’s for the past three years, and was a regular at Brother Jimmy’s Bait Shack for a number of years before that. His first exposure to post-traumatic-stress syndrome occurred after watching Super Bowl XXV live in Tampa, FL.